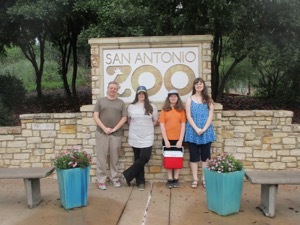 We had an unexpected change of plans for Spring Break this year, and when I gave the kids a choice about other options, the one they all agreed on was a road trip down to Texas to get the (possibly) last Mold-A-Ramas from a zoo for our collection. 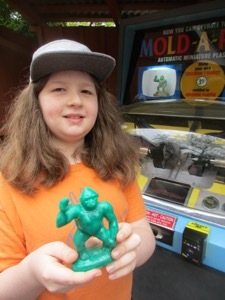 San Antonio was the one place on the Mold-A-Rama map that we didn't know if we'd ever reach. There's no reason for us to go there. So we seized the opportunity to do something random and went with it! San Antonio is lovely, and I will write about the whole trip soon in a different post, but for now we will focus on the heart of our mission: The eight Mold-A-Ramas at the zoo. It's a lovely zoo. (And at this point we know zoos.) 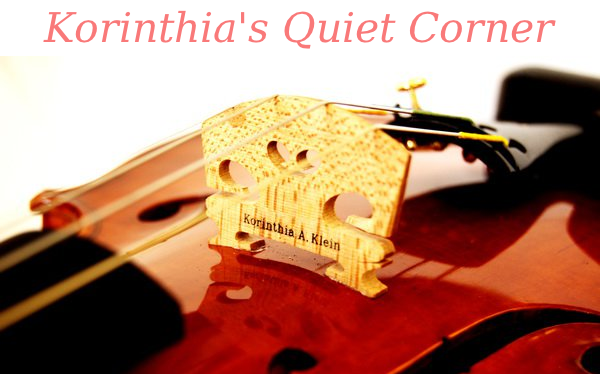 It's compact and laid out very well. It had the most memorable collection of birds I think we've seen at any zoo, including a ton of storks or cranes (not sure which but they were long and white) and vultures and grackles that were there voluntarily in droves to nest in the trees in the park. We showed up very shortly after the zoo opened at 9:00, along with our small cooler to collect (and protect) our Mold-A-Ramas. There were signs saying coolers weren't allowed in the zoo, but I showed the woman at the gate that there was no food in ours, and we'd come all the way from Wisconsin just to get Mold-A-Ramas and wanted to make sure they didn't break, and she let us take it in. There are eight machines in the zoo, all arranged in pairs in four spots. The first place we stopped, however, had no power! We asked a zoo employee why the machines weren't on and she said that whole area of the park was having maintenance done and power wouldn't be back on until probably 1:00. Not an auspicious beginning, but also one of those times we are reminded that our collection is ultimately silly. 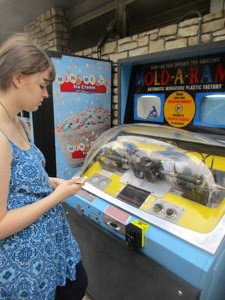 We were there really just to enjoy time together in a new place, so it would be disappointing not to get all the Mold-A-Ramas we came for, but nothing to get truly upset about. I did call ahead before we settled into our plan to make sure the machines were running before driving to the other side of the country, and they assured me they were, so the two powered down machines were only a temporary setback. 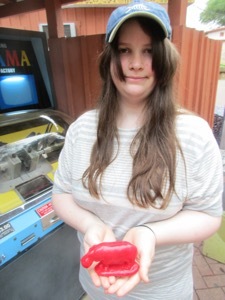 We hit them again after lunch on our way out of the park and sure enough they yielded our precious plastic toys. They were all figures we already have from other zoos, but they were all good, and the machines worked well. 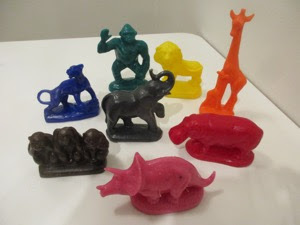 We got another waving gorilla, the three monkeys, a triceratops, giraffes, a lion, a panther, an elephant, and a hippo. A new twist on the machines: They take credit cards now, and the price seems to have gone up universally from $2 to $3. An excellent day and an excellent haul! 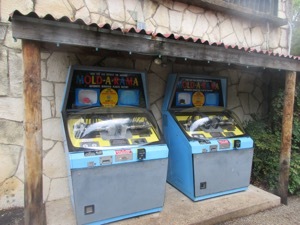 I can't believe we actually have Mold-A-Ramas we got ourselves from San Antonio. 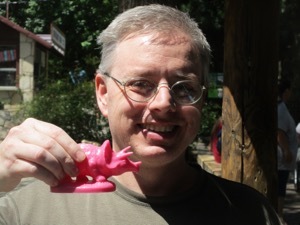 I love that those little plastic animals represent such a fun family adventure. It was a great trip. 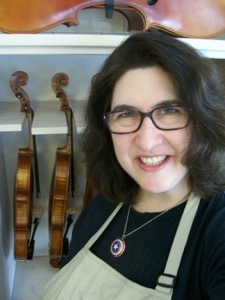 Up next, a stop in Nashville for our only musical instrument Mold-A-Rama! 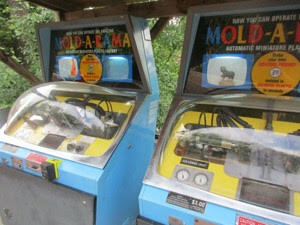 I love your moldarama posts!! Sounds like great trip, can't wait to read about the rest of it.